The blood is a red liquid , It consists of the plasma , the blood platelets , the red blood cells ( the corpuscles ) , And the white blood cells ( The corpuscles ) . The blood transfers the materials to all the body cells , where the red blood cells carry oxygen and carbon dioxide , And plasma transports the food , the vitamins , the salts and the harmful wastes . The blood protects the body , where the white blood cells attack the microbes that cause the diseases to the human , The blood platelets help in healing the wounds , And the blood keeps the temperature of the body constant . The plasma is a yellow watery fluid in which all the blood components are suspended . It carries the needed food substances to the body cells , and it carries the harmful wastes that formed in the cells to get rid of them , The blood is a fluid due to the presence of the plasma which is a watery fluid . 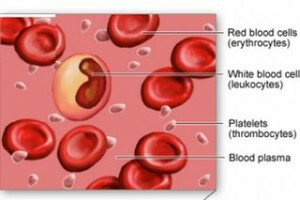 The blood platelets are the small cell fragments . It helps in the coagulation of the blood ( the formation of the blood clot ) , So they help in healing the wounds . When the body is wounded and the blood exposed to the air , the platelets stick to prevent the bleeding and they heal the wounds . The red blood cells are the red cells without the nuclei . They carry oxygen gas from the lungs to all the body cells , And they carry carbon dioxide gas from all the body cells to the lungs . The white blood cells are the white cells with the different forms of the nuclei , And they defend the body against the microbes by attacking them .